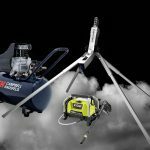 Below are complete snowmaking machine packages to make your backyard snowstorm. 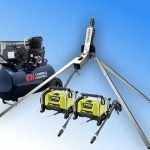 Each package contains the proper nozzles, connections, air compressor, and pressure washer options to fit your home snowmaking needs. At Backyard Snowstorm, we provide pressure washers and air compressors that have been selected based on their quality (high user ratings and our experience) and their suitability to our system. We drop ship these items to your home directly from well-known distributors (such as Home Depot, or Lowes) and charge you a nominal handling fee. If you have any issue with these units, you will have a sales receipt and must deal with the seller directly. 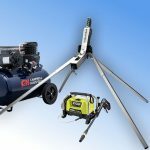 We provide you the option to select each package without the associated pressure washer, or air compressor if you wish to purchase these directly. 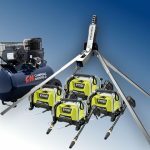 We provide residential quality pressure washers and air compressors at more affordable prices. In our experience, these units will last 1 to 2 snow making seasons since they are not made for long-term continuous use. We also provide commercial machines that will stand up to the rigors of hundreds of hours of continuous use, and we highly recommend that you make this investment when and if you can. 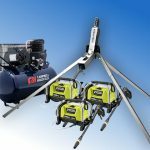 Pressure Washers and Air Compressors are available for drop shipping in the US only. For Canada and other countries, please select the desired package and indicate that no air compressor or pressure washer is required in the options. You can follow the specifications of our recommended models to find a suitable unit from local sources.